Cable Glands for Hazardous Locations! Ex-e & Ex-d ATEX, IECEx Cable Glands for Hazardous Locations. RJ45 Industrial Ethernet Cat5e Connectors. Designed for Armored and Non Armored Solutions. Ex-e & Ex-d Thread Adapters, Enlargers & Reducers. Cable Glands for Hazloc Areas! 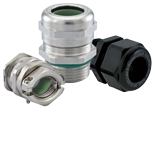 Sealcon Hazloc product line is designed for Hazardous Areas and Increased Safety Locations. They Provide Armored and Non Armored Solutions. Whether your need is Nylon, Nickel Plated Brass, Stainless Steel our Ex Cable Glands will hold up. Our Products meet the latest North American Approvals cUS as well as ATEX / IECEx Standards. Ex-e and Ex-d Class, Div and Zone Ratings Approvals. See Why to Choose Sealcon for your next application. Don't settle for less choose Sealcon quality! Guides to identify the best product for your applications.